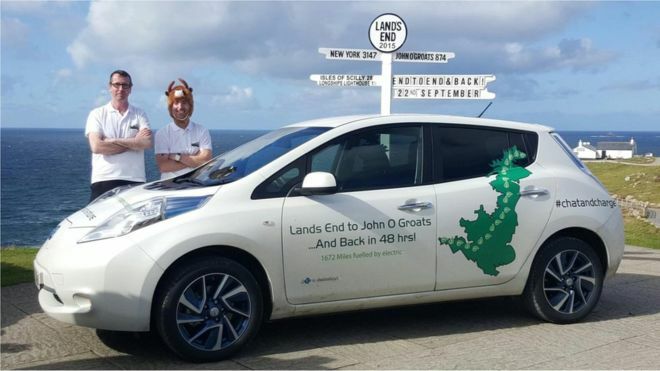 Jonathan Porterfield, from Orkney, and Chris Ramsey, who lives in Aberdeen arrived back in John O’Groats on Thursday 23rd September after completing an epic double end to end in a claimed record time. The pair were attempting to traverse the length of the country, twice, in under 48 hours, using only the existing public rapid charge infrastructure. Sadly they missed this target with the first leg, from John O’Groats to Lands End, being completed in 28 hours and 38 minutes and the return in 27 hours and 46 minutes. It is believed that the quicker of these two times is still a record and the duo have duly submitted an application to Guinness World Records. Well done lads but gets some balls and try it by bike next time.